The US Postal Service has revealed five more subjects to be featured on USA stamps during 2019, including tennis champion Maureen Connolly Brinker and artist Ellsworth Kelly. The United States Postal Service (USPS) has revealed the designs of five more stamp sets to be issued in 2019, following the release of a provisional schedule at the end of 2018. 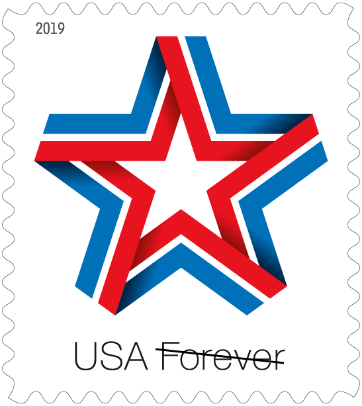 Designed to meet the needs of business mailers, this single stamp features a digital illustration of a star made of red, white and blue ribbon. The white space in the middle of the ribbon creates a second smaller star. According to the USPS: 'The tri-colored ribbon, folded into a patriotic symbol, is intended to evoke the connectedness of the American people.' The stamp will be sold in coils of 10,000 and in panes of 20. Another single stamp will honour tennis champion Maureen Connolly Brinker (1934–1969). Nicknamed "Little Mo," the 5-foot-4-inch athlete became the first woman to win all four major tennis tournaments in a calendar year. 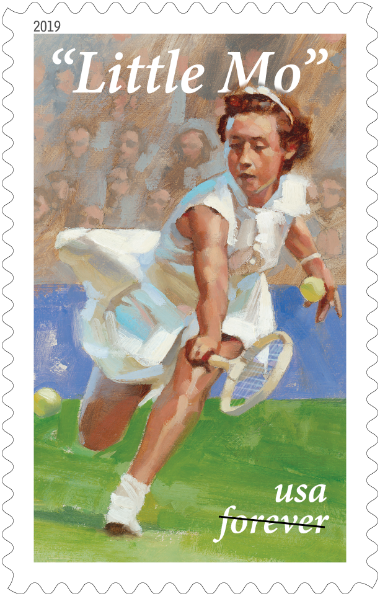 The stamp features an oil-on-linen painting of the tennis star by Gregory Manchess. 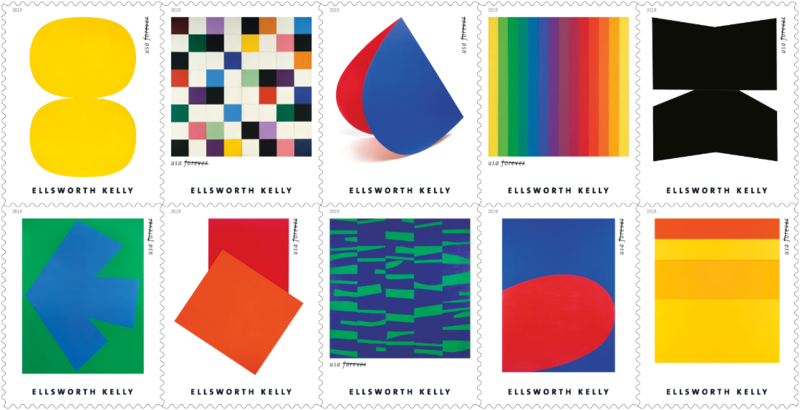 This ambitious ten-stamp set honours artist Ellsworth Kelly (1923–2015), who pioneered a distinctive style of abstraction based on real elements reduced to their essential forms. His artworks include paintings, sculpture and works on paper. 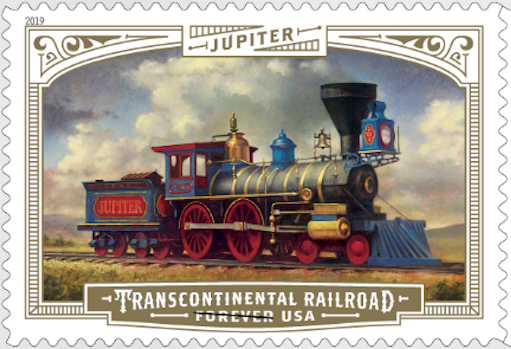 Perhaps the most colourful set to be revealed is three stamps in a pane of eighteen mark the 150th anniversary of the completion of the transcontinental railroad, which made the American West an integral part of the nation. Two different stamps feature the Jupiter and the No. 119 locomotives, whilst a third stamp portrays the famous golden spike that was a prominent part of the ceremony that saw the two lines join. The US nation’s 'brave and loyal military working dogs' are also to be honoured with a booklet of twenty stamps. 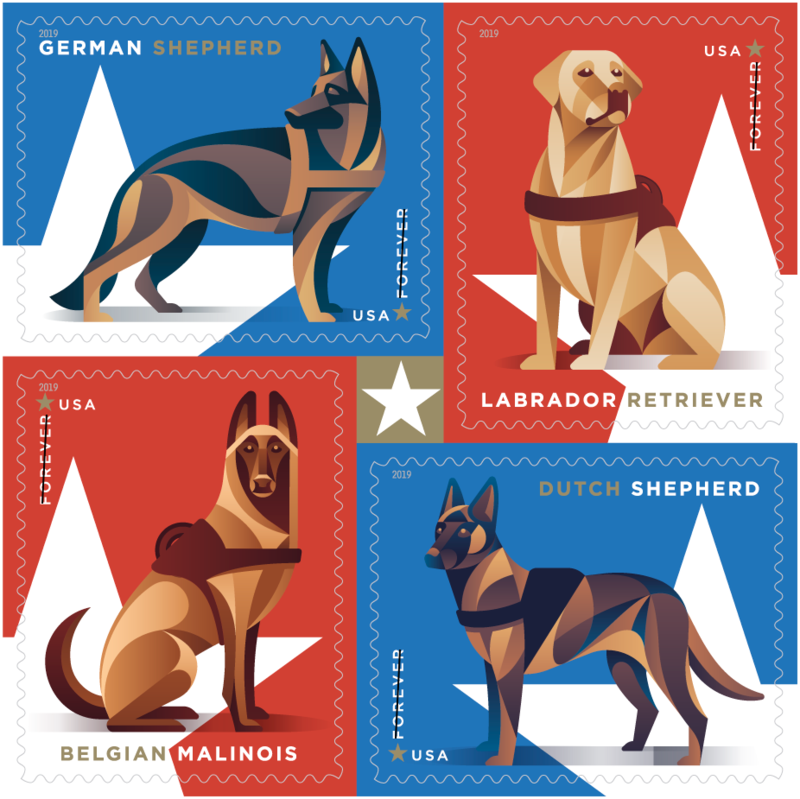 Each block of four stamps features one stamp of each of the following breeds — German shepherd, Labrador retriever, Belgian Malinois and Dutch shepherd — that commonly serve in America's armed forces. See our dedicated stamp guides to read more about USA stamps.